25% Till end of April. I'm very excited to announce our new product Dry fit Color block Competitor T-shirts. What a wonderful shirt that's a dry fit beautiful looking T-shirt that will make you look sharp fit and unique everywhere you go. It's lightweight coming at 3.8 ounces which makes it beautiful for Houston weather heat. Plus it's made with hundred percent polyester the most common type of dry fit , and it's tagless. What is amazing about this shirt is that the stripes come from all angles yet the front is fully clear. The other thing I love about the shirts is a unique colors it comes in 13 different colors including black line or forest gold or tropical blue. I don't know about you but I've never seen a tropical blue with black. You really want to try it one to get one for free. Order 24 or more of those beautiful shirts with left chest embroidery included for only $18 a shirt. So till end of April get 24 shirt for only $18 with left chest Embroidery. Limit upto 7K stitches. .on't wait! This is Amazing Deal on Quality Shirt. We took our popular Competitor Tee and added some attitude with colorblocking on the shoulders, sleeves and sides. The result? 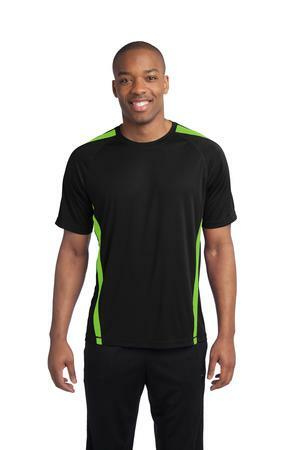 An even more colorful, sweat-controlling, breathable tee that’s easy on the budget. Pictured in Black/ Lime Shock.